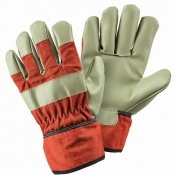 A great heavy duty glove that is lightweight enough to allow full dexterity, the Briers Suede Rigger Work Gloves allow the user to carry out all general gardening tasks as well as the tougher and more awkward tasks. The Briers Suede Rigger Work Gloves are also tough enough to be used for DIY jobs when more protection is required. The Briers Suede Rigger Work Gloves are made from a high quality soft leather, with protection across the palm and fingertips. The suede leather palm and fingertips along with the cuff protection makes the gloves ideal for use when cutting down bushes and thorn trees.. Designed to comfortable to wear, the Briers Suede Rigger Work Gloves are hard wearing yet ultra soft to the touch. 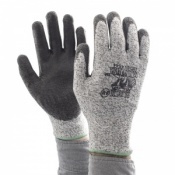 The high quality leather and canvas used ensures the Briers Suede Rigger Work Gloves are a long lasting glove. The product code for these gloves is 0087. 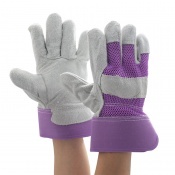 The Briers Suede Rigger Work Gloves are supplied in Extra Large size. 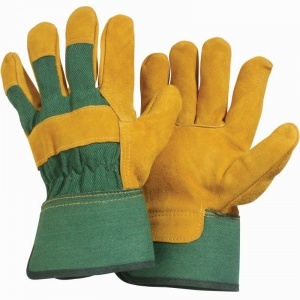 The Briers Suede Rigger Work Gloves are supplied in pairs. Extra large size is good for me. Seems difficult to find ones this large generally.